Hearing Testing. Have you noticed an inability to hear friends and family in noisy environments? If you or someone you love is showing signs of hearing loss, we offer free hearing screenings to determine the problem. 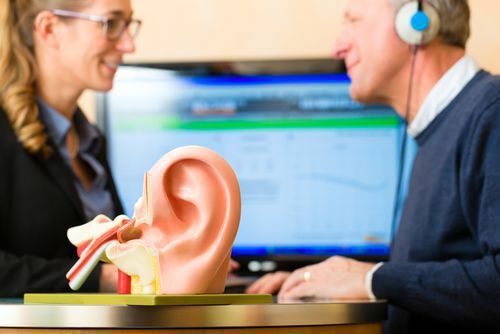 Our trained hearing specialists use the latest technology to diagnose your condition. Hearing Aid Devices. We offer top-of-the-line hearing devices from Resound and Widex, in a range of colors, models, and styles. We work with patients to make our digital hearing aids affordable, offering 0% financing plans, accepting many insurance providers, and offering free trials on your chosen device. Hearing Aid Repair and Maintenance. If your hearing aid has stopped working, we can repair most hearing aid makes and models right in our office. Our technicians repair all hearing aid brands, whether or not your device was purchased from us. We can also perform cleaning and routine maintenance, and can reprogram your device to make sure it is optimized for your ears. Tinnitus Evaluation. If you have experienced a ringing or buzzing sound that nobody else can hear, you may be suffering from tinnitus. This condition may be temporary due to wax buildup or illness, or can be a permanent side effect of hearing loss. Our hearing providers can find the solution to stop distracting head noise, including maskers and hearing aids that can ease the ringing in your ears. Our hearing care providers are also available throughout Maryland, ensuring that patients can get the same caring treatment without traveling far from home. Click on one of our office pages today for easy driving directions to the location nearest you!